As the world is uniting to celebrate the International Girl Child Day, we in Kosovo are in this as well! The International Day of the Girl Child is celebrated annually on October 11 to highlight issues concerning the gender inequality that young girls still face. IPKO Foundation (IF) honors this year’s theme proposed by the UN “With Her: A Skilled GirlForce” which focuses on learning by doing and using education as a tool to empower girls in breaking the barriers in a man-dominated profession, with specific emphasis in ICT sector. 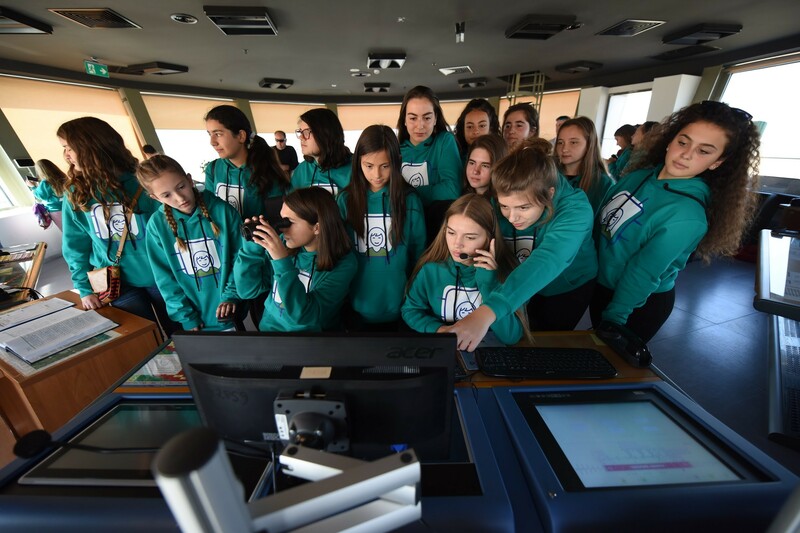 Our first stop at the Air Navigation Services Agency gave our girls a hands-on experience in the work it takes to land and depart an airplane safely. They visited the Radar Room, and Control Tower, where they got the chance to witness the landing and departure of the planes. Our girls also had the chance to meet other women who worked in this agency, in fact, one of the women working there is the first female to work, dating from the 1999’s. We hope that in the future one of these girls will make sure your plane will land safely! During the second stop at Zombie Soup, the girls got to learn more about front-end, back-end, programming, and VR experience. Our friends at Zombie Soup proved all stereotyping wrong! In a male-dominated sector, Zombie Soup has over 12 women working for the company, a proof that every girl can reach their potential. Throughout this day, the girls got the opportunity to meet women with profiles and professions that are mostly dominated by only one gender. These women served as a model for inspirations for the girls, by pushing them to pursue their dreams no matter the limitations. This activity was brought to life, through the cooperation of IPKO Foundation with Unicef Kosovo Programme, USAID Kosovo /ASSET Program, Kosova Education Center – KEC, Agjencia e Shërbimeve të Navigacionit Ajror – ASHNA, and Zombie Soup.